If you require additional traction, the Bobcat 3400 4×4 is an excellent choice. The hard-working utility vehicle is ideal for farming, ranching, hunting and recreational activities. True four-wheel drive sends torque to every wheel when you start to slip. If the rear wheels start to lose traction, the front wheels engage to power you through the difficult terrain. The Electronic Fuel Injection (EFI) system, 32-hp gas engine or the 24.8-hp diesel engine and top traveling speed of 30 mph help you accomplish more during your day. Critical machine components are protected by a CVT cover, skid plate, suspension guard and bash plate. 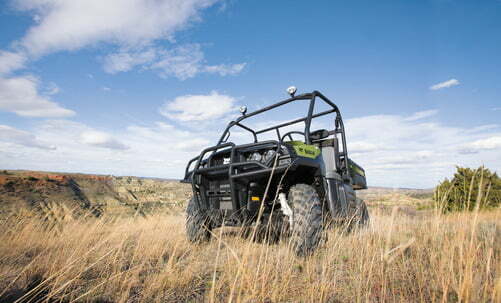 Enjoy quiet operation, bucket or bench seating options, and 3-point shoulder harnesses. Increased Horsepower: Get speed, acceleration and power, whether you&slquo;re traveling or hauling heavy loads. Tough and manoeuverable Multiservice vehicle with 2500 kg capacity and hydraulic transmission. Tough and manoeuverable multiservice vehicle with 2500 kg capacity and mechanical transmission. Tough and manoeuverable multiservice vehicle with 1500 kg capacity. The Task 50 is a reliable and resistant UTV (Utility Terrain Vehicle) with exceptional rough terrain characteristics, while maintaining its agility and high speed when circulating off-road. With this vehicle, you will be able to access difficult to reach areas in the most extreme conditions, and accomplish multiple tasks.